UC's Darrell Menina had to be restrained from going after a CIT-U player after the game. 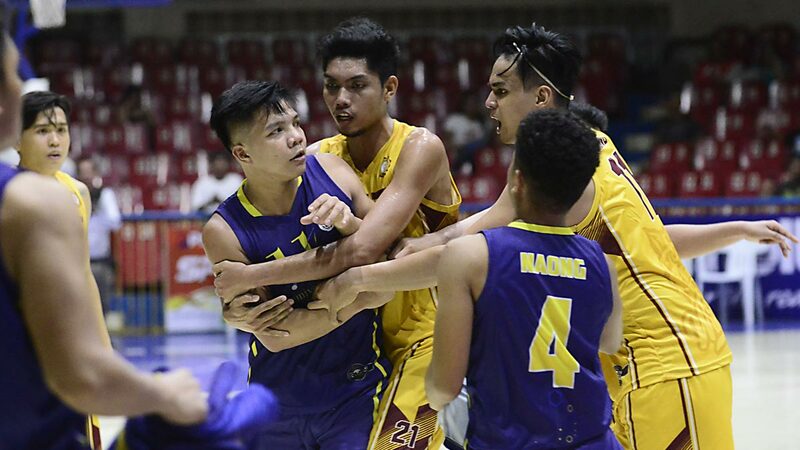 CEBU CITY – Bottom team Cebu Institute of Technology-University managed to take down league leader University of Cebu, 81-75, on Saturday in the 2018 Cesafi basketball tournament at the Cebu Coliseum. The Wildcats just got their first win of the season earlier this week and added their second in electric fashion, leaning on clutch baskets from Jessie Aloro, Kevin Oleodo and Jemcerson Sable down the stretch to secure the victory and boost their record to 2-7. UC dropped to 8-1, dashing its hopes of gaining an outright spot in the finals. Sable gave the Wildcats a four-point cushion with a triple, 79-75, with 13.5 seconds to go. A bad pass by Darrell Menina on UC’s inbound and a transition layup by Aloro on the other end sealed the win for CIT-U. The fireworks carried over to the postgame handshakes as Oleodo and Menina got into it before the coaches were able to separate the players. CIT-U led for most of the game but UC grabbed the driver’s seat, 71-68, after a floater by Menina and a putback by Fritz Ordeniza, 2:08 to go. The Wildcats responded with a triple from Sable that knotted the count at 71. A layup by John Jabello shoved the Webmasters back in front but CIT-U wingman Kevin Oleodo canned a corner trey to give the Wildcats back the lead, 74-73. UC regained the lead after a layup by Menina but Oleodo took advantage of UC’s small lineup, beating UC guard Paul Galinato for position in the post before banking in a layup to put CIT-U back in front, 76-75, time down to 43 seconds. Five players scored in double figures for the Wildcats led by Aloro who had 23 points, seven rebounds and four assists while rookie sensation Kenny Rogers Rocacurva added 14 points, five boards, two assists and four steals. Mark Kong collected a double-double of 12 points and 10 rebounds while Sable and Oleodo finished with 10 apiece. The loss spoiled the 27-point, 22-rebound showing of UC’s Cameroonian forward Frederick Elombe. CIT 81 - Aloro 23, Rocacurva 14, Kong 12, Oleodo 10, Sable 10, Con-ui 8, Rosell 2, King 2. UC 75 - Elombe 27, Jabello 17, Menina 15, Naong 4, Ordeniza 4, Galinato 2, Manguerra 2, Tagudin 2, Codilla 2. Quarterscores: 19-21; 41-38; 59-56; 81-75.